2018 has been all about learning to do things on my own. Buy a home, navigate holidays, make the bed, move furniture, walk the dog, cut your own Christmas tree.... *insert menial task here* and the list goes on and on. I am no stranger to a solo hike or adventure and I describe myself as a very independent person. But let's face it, there are some things you have to sort of re-learn to do alone. Mountain biking is something I always did with someone else or with a group. Honestly, it was a hobby of Thatchers that I absolutely hated at first and eventually learned to love. It was never something I did on my own, or something I sought out as a solo activity. 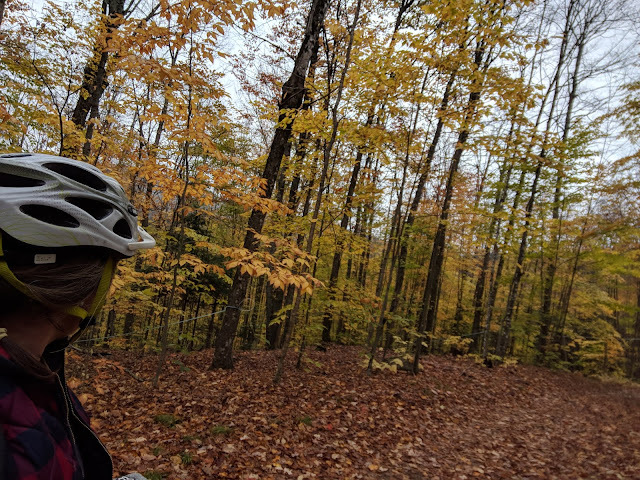 Something I wanted to tackle this fall even if it meant solo, was mountain biking at my favorite New England spot - Kingdom Trails. 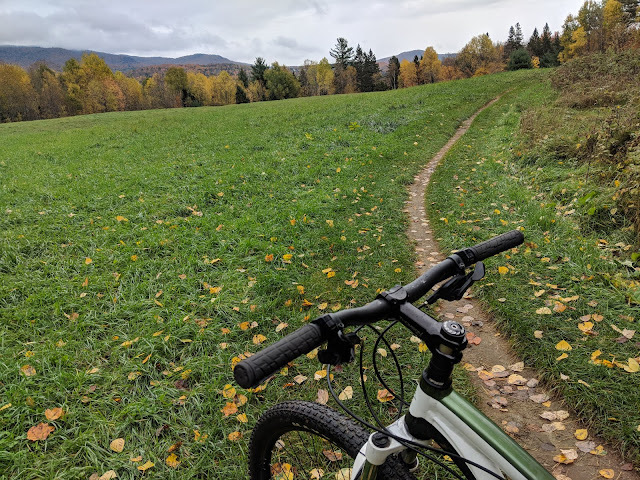 I posted all about it last year, but if you don't feel like backreading just know its an amazing trail system loaded with tons of flowing non-technical trails through picturesque Vermont. It's the kind of mountain biking I love and the type I haven't been able to find outside of Utah. 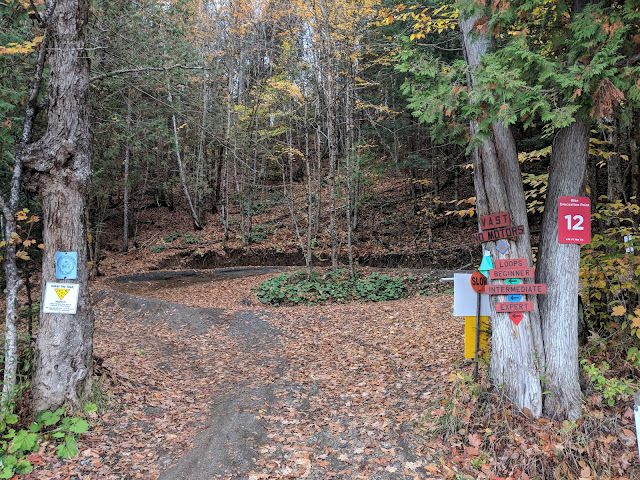 Even outside the awesome trail network, the entire town just has that laid back Vermont and bike town vibe - the Moab of the Northeast if you will,. A weekend in East Burke was the fall trip I always looked forward to. 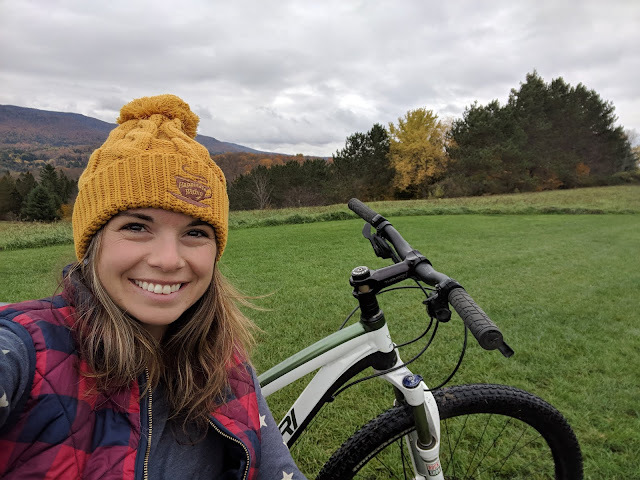 Life changes and this year I found myself heading up alone to ride the Kingdom and explore Vermont. So on a Friday late at night when the rest of the world was sneaking into bed or settling up their bar tab, I loaded up my bike and started driving North. 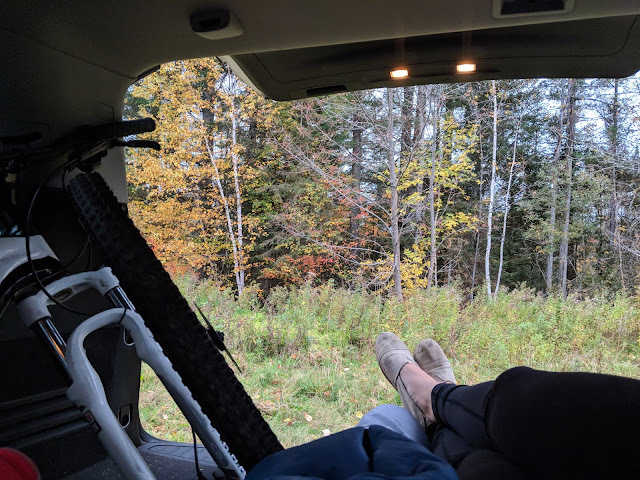 My plan was loosely formed, basically drive to East Burke at 11 pm on a Friday night, sleep in my car at the trailhead (at 2 am, thank goodness for large SUVs) and in the morning, hop on my bike and bike some of my favorite trails. 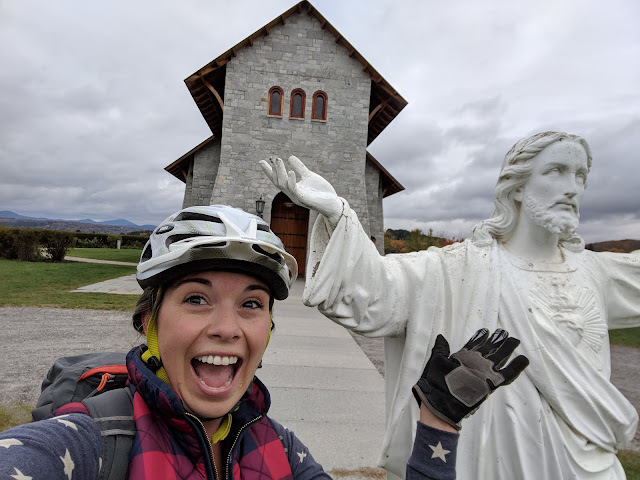 I knew I wanted to bike to Heavens Bench, head to the Chapel, stop for lunch at the Bike Shop, and explore some new-to-me trails. 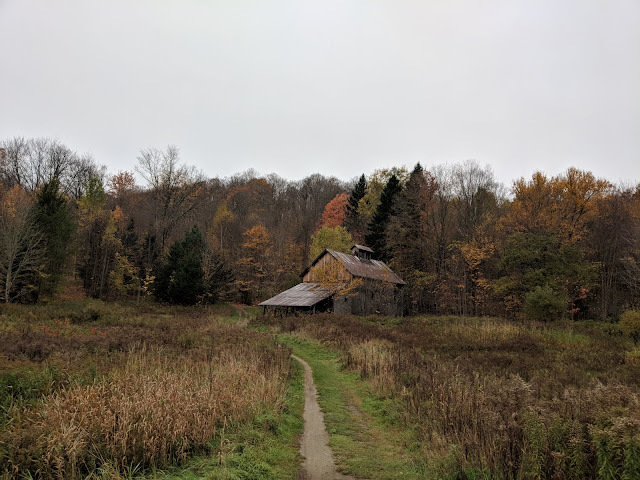 On a cool overcast Saturday morning (the weekend after Columbus Day when I normally visit and the trails are mobbed) East Burke felt sort of like a ghost town. 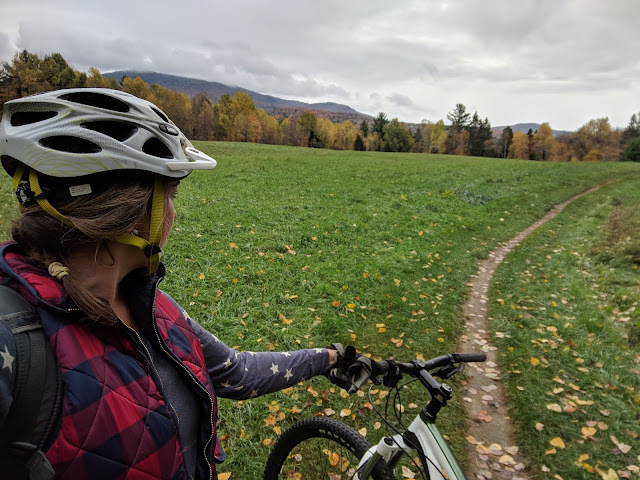 As the day would have it, I rode my bike down perfectly perfect trails in absolute quiet with Vermont's show offy fall foliage wrapping me up in October. 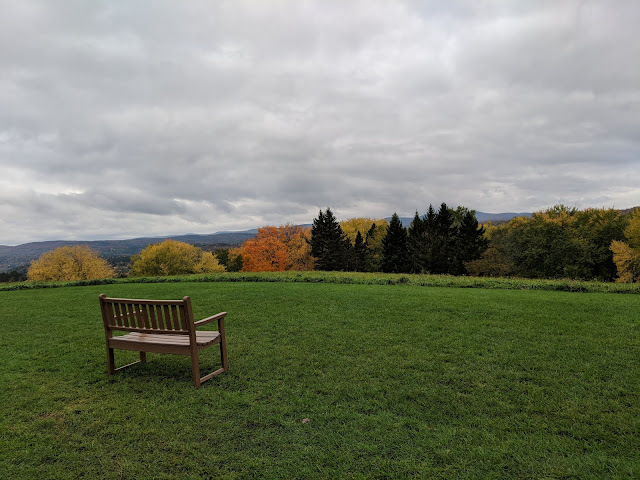 It was a lot of bliss, a lot of appreciation for living in New England, and only a little bit lonely. I appreciated the fact that I could ride at my own pace, pick whatever trail I wanted, and yes stop for 200 pictures..... liberties that are not always granted when riding in groups. 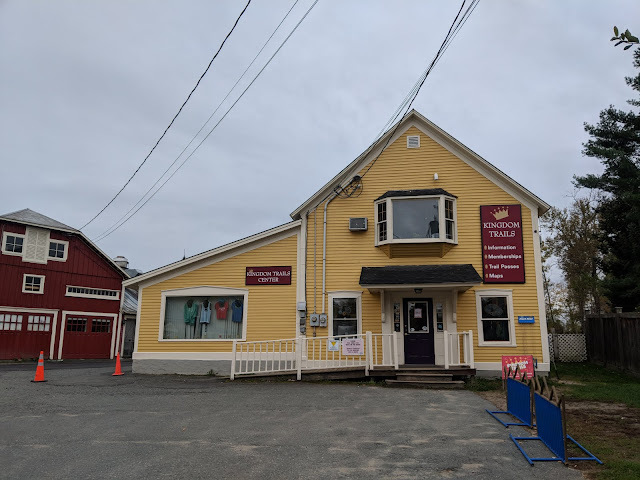 I started off my day with a stop at the Visitors Center to buy my day pass and then headed across the street for breakfast at the Northeast Kingdom Country Store. It's one of those iconic Vermont country stores where you can grab breakfast, some kitchy decor items, and a jug of maple syrup. 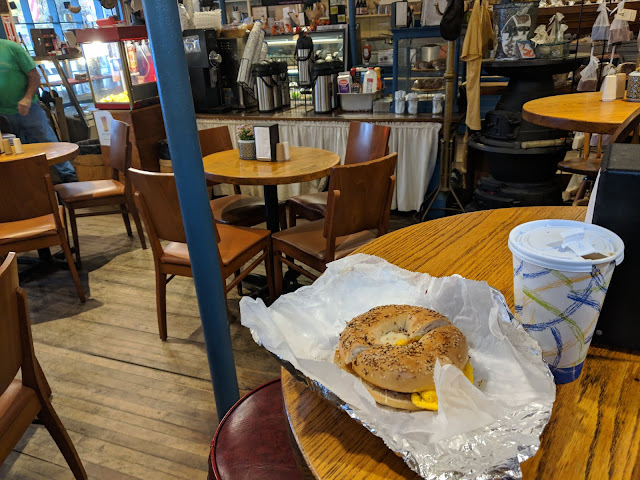 I was the only one here early on a cool Saturday morning and I chatted with the staff while waiting for my breakfast sandwich and hot coffee. Any day that starts with a made to order breakfast sandwich and hot coffee and a country store in Vermont is a good, good day. After breakfast, I hopped on my bike and headed into the trails. 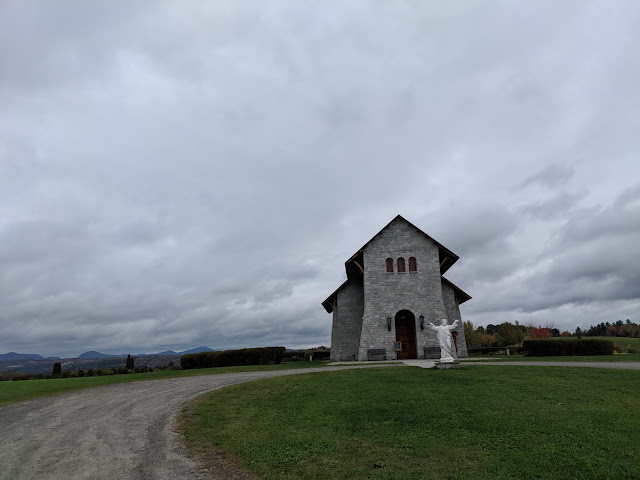 I spent the morning in complete solitude biking along and enjoying the trails and the stillness before eventually making my way down to one of my favorite spots, the Chapel. I enjoyed a snack at the Chapel, what I consider to be one of the prettiest spots in the Kingdom. Picture this beautiful little building, perched on a hill overlooking East Burke with the amazing foliage that Vermont is famous for. As I sat there with Bike Jesus (the statue bikers love to pose with, myself included) enjoying my snack, I watched a couple get engaged and sat there watching with a smile on my face - in love with the idea of love. I watched their friends run out of their car with champagne who were watching from a distance and witnessed the face timing phone calls with exciting news to family and friends. It's not every day you get to accidentally crash an engagement while snacking on apples and peanut butter with a statue of Jesus. 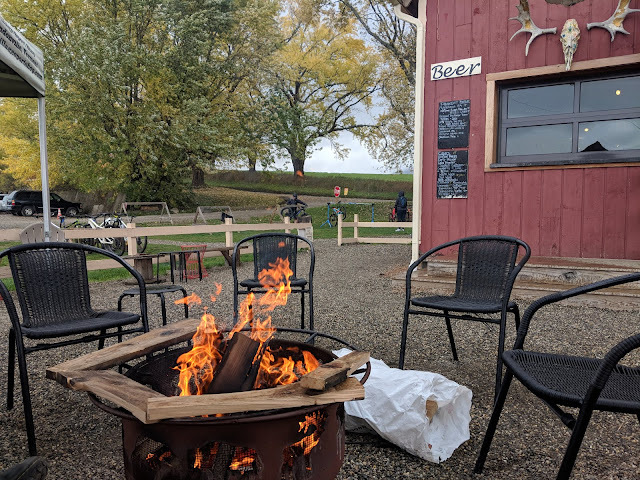 After my snack and mandatory photo op, I spent the early portion of the day biking along the Kingdom before finally stopping for lunch and a beer at the Bike Shop - the coziest and most quaint little bike shop, bar, and cafe. It was here I sat around the fire, drank a delicious thick and creamy maple breakfast stout, and made some friends with some fellow New Englanders who had made the trek from Massachusetts to enjoy the trails. 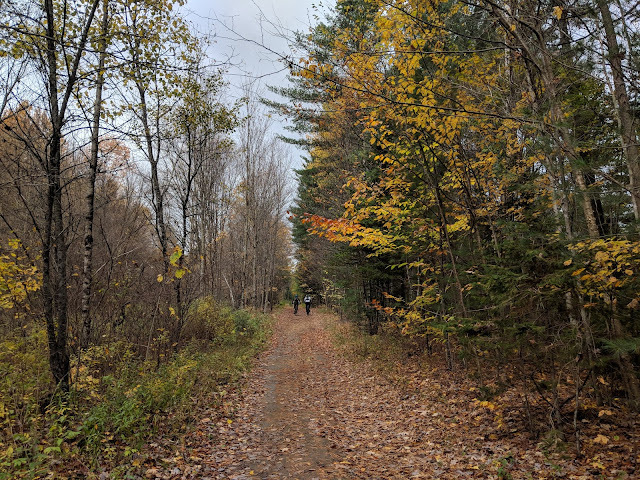 We sat around the fire, chatting about New England and just how special this trail network is. After 2 beers and a sandwich I had packed in, I was happily sedated on Vermont charm, good beer, and good company. As the group started to leave the fire and pedal away, I slowly packed up my belongings and made my way to the bike rack. 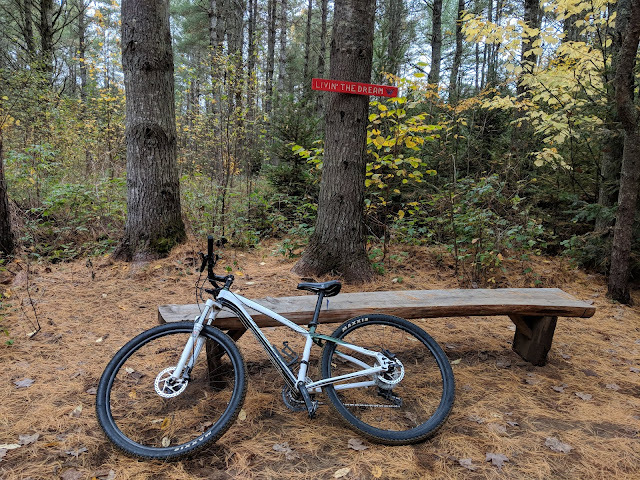 I somewhat reluctantly hopped back on my bike and spent another hour or so biking around the only slightly busier trails. 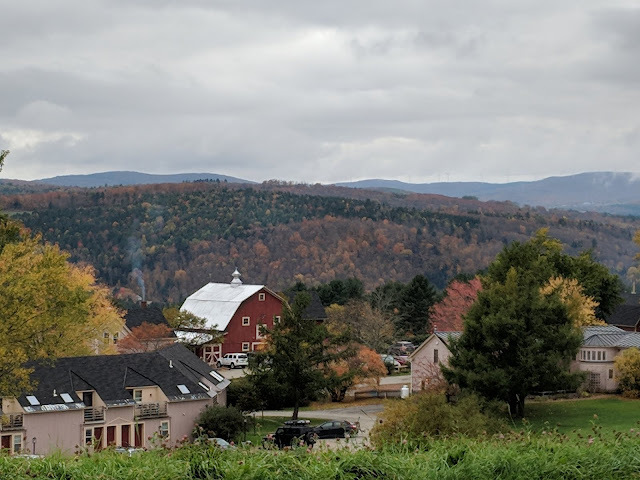 After my tired legs and sore seat bones told me I had had enough I loaded my bike back in my car and headed west to spent the night in Stowe at a friends condo. 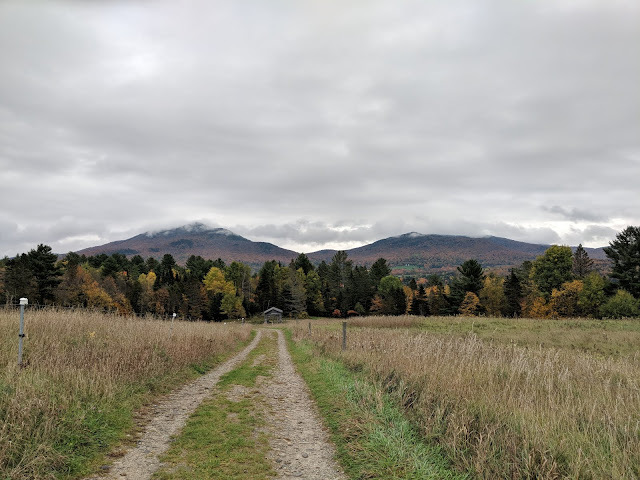 As peaceful as it was to wake up at the trailhead, I was really looking forward to a hot shower, warm bed, and waking up in another amazing Vermont town, Stowe. 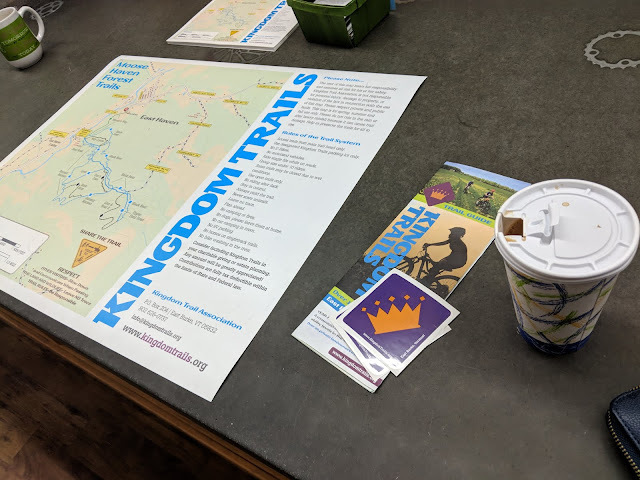 I drove out of the Kingdom with the town lingering in my rear view mirror as I recapped a fantastic day biking Kingdom Trails, so glad I made the journey up alone. Truth be told, I was surprised to find just out much I enjoyed this trip on my own, a trip I had only done with a group to date. I suppose it helps that I am a people person to my core and can make friends with anyone just about anywhere. Whether it be fellow bikers at the bike shop or staff at the country store, it's nice to enjoy some company between the moments of solitude. It is so easy to get stuck in your own loneliness and suffer from routine-itis when it comes to doing some of the things you love. There's a great quote from an author I love in one of my favorite books about loneliness, and how important it is to embrace it, live in it, and get used to it. If you wait for someone to do all the things you want to do in life (buy a house, go on that trip, insert example here), you may be waiting a long time. I hope you can be comfortable with loneliness, and feel that empowerment that comes with it. I am thankful for my independence, can do attitude, and drive to do the things I love even if that sometimes means I am doing them alone. Cheers to another great day of riding at Kingdom, and for never being afraid to jump in my car alone and just start driving north.